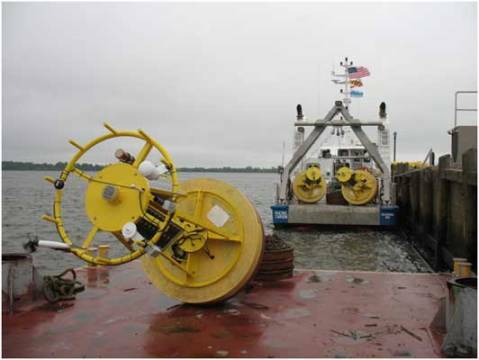 Woods Hole Group is entering into its fifth contract year with the Philadelphia Water Department (PWD) in consultation for a project entitled “Measurements of Current Profile and Water Quality Processes in Select Tidal Reaches of the Delaware Estuary”. The project is required by the PWD Office of Watersheds to support development of a multidimensional hydrodynamic and water quality model for tidal portions of the Delaware River from Trenton, New Jersey to Delaware City, Delaware, including the Schuylkill River and other major tributaries. Through discharge of treated and untreated (CSOs) wastewater effluent, the City is a point source contributor of nutrients to the Delaware River estuary. Due to the impact of treated wastewater and CSO discharges on water quality, regulatory agencies acting under the authority of the Federal Clean Water Act require the City to manage their discharge. Among other progressive efforts by the PWD to address this issue, the model was developed in response to requirements included in the 2011 Consent Order and Agreement between the Pennsylvania Department of Environmental Protection (PADEP) and the Philadelphia Water Department. The PWD water quality model specifically allows the City to evaluate how the hydrodynamics of the Delaware River estuarine system influence the biogeochemical cycling of nutrients between the water column and sediments of the system – ultimately this is what affects water quality of this urban estuary. Successful implementation of this model will identify the best management practices for improving water quality. Three long-term stations prepared for deployment, May 2012. 2) collection and analysis of sediment and water samples to directly observe nutrient and oxygen flux. These data collection tasks provide the backbone critical to the development of PWD’s model. Woods Hole Group performed the hydrodynamic and water data time series collection task, and assembled a team of local experts to assist with biogeochemical data collection and analyzing. Teaming partners include Chesapeake Biogeochemical Associates, the Academy of Natural Sciences of Drexel University, and Dr. Christopher Sommerfield from the University of Delaware. 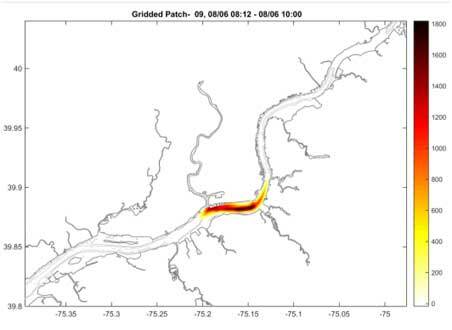 Additionally, we teamed with Dr. Robert Chant of Rutger’s University to perform a dye tracer study to evaluate the rate of dispersion in this tidal system. 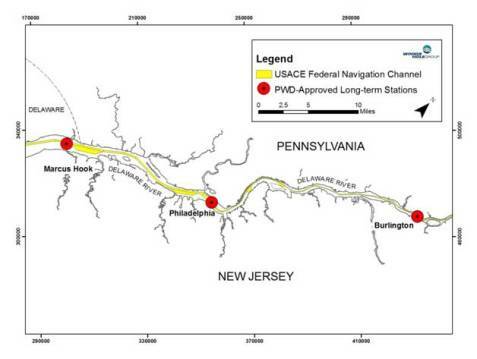 Overview of the three long-term stations in the Delaware River. •	Dye tracer study, performed in coordination with Dr. Robert Chant of Rutgers University, to evaluate the accuracy of the rate of dispersion in the hydrodynamic model developed PWD. Gridded dye patch observed during the dye tracer study, August 2014. Recently, the PWD submitted their final modelling report to the PADEP and United State Environmental Protection Agency. The report was positively received and graciously acknowledges the work of the Woods Hole Group Team in providing the quality data required to complete their project. Although the report was submitted and requirements were satisfied, the PWD views the model as a valuable tool for resource management. PWD committed to fine-tuning their model, which is why the City has contracted the Woods Hole Group Team for up to four more years. For more information on the PWD water quality model, please visit their website. Buoy C (on station 2013) collecting observation of current profile, conductivity, temperature, dissolved oxygen, atmospheric pressure, air temperature, wind speed, and direction. This complex interdisciplinary project showcases Woods Hole Group's ability to manage large scale field data collection efforts – as well as the ability to work with recognized subcontracting partners that complement our areas of expertise.